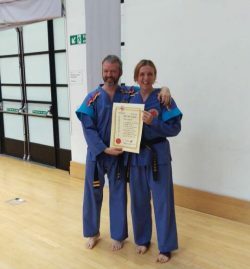 In an effort to find out more about Grant’s experience training for and achieving his 2nd Dan Black Belt we delved into his training, mindset and motivation. The following questions reveal much about Grant and our terrific sport. What was your main motivation for attempting the grading? My motivation for attempting the grading was to conquer some of my own demons after coming back after such a long time away, I realized I wasn’t as fit or flexible as I was when I was younger and I found myself living in my own past I had to do this to move on and start a new chapter. What did you enjoy most about training for the grading? 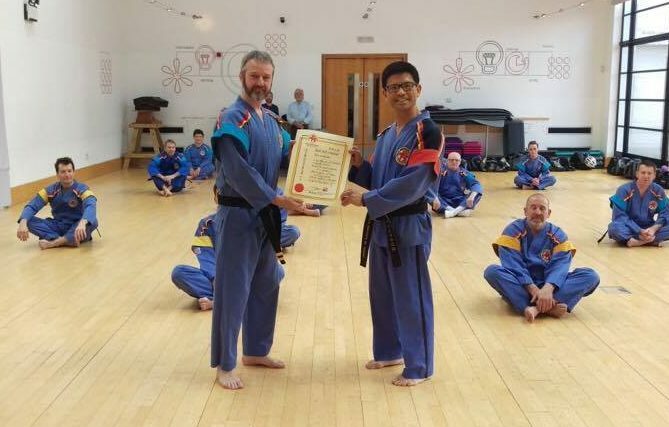 What I enjoyed the most about training for the grading was the support shown by everyone who trains and being able to train regularly under Grandmaster Teh is just inspiring. What did you find most difficult when training for the grading? The most difficult part of the training for me was avoiding injury I mean I’m no spring chicken anymore. How did you feel during the oral examination prior to the grading? During the oral exam I went in calm and confident and came out a wreck second guessing my own name. How did you feel on the day of the grading before it began? Before the grading (the first attempt) I felt OK and confident and we know how that ended. The Second time I was a bag of nerves and well that turned out better. What did you enjoy most on the day? What did you find most challenging on the day? What I enjoyed the most about the gradings was is the destruction. The biggest challenge of my grading was my fitness the grading doesn’t last as long as a class but it brings it’s own intensity because you will put your all into it and if you make a mistake and have to reperform it takes a lot out of you. How do you feel about having passed? Relieved and more importantly re-energized I can’t wait to learn new forms and challenge myself! Now that you’ve passed, what’s your focus for your Tukido training? My focus for my training now is to look towards becoming an instructor.